I broke down and bought Mockingjay Part 1 on Digital. Life is short, and JJ’s got Amazon Video credits. I’ve had some fun and some tears watching the movie again this week. Owning the movie (and watching again & again) allows you to zone in on some of the details, and obsessive fans that we are, we love all of it. First, let’s go back to a post from a few weeks back when I said it looked like Peeta’s house had been destroyed. I didn’t have an image of it then, but now, check it out. The houses across the street from Katniss and Haymitch are gone. Please rewrite all your end of Mockingjay fanfics with that new twist. I can never get enough of those fics anyway. There’s some more details of the world-building from a deleted scene of Katniss and Boggs walking through 13. Sadly, this did not include running into Finnick in only his underwear, but it showed some really cool new things. The final trailer was released this morning, and that means one thing– collective fandom flailing across the globe, and a patented Victor’s Village reaction post featuring all three of us. So without further nattering, here’s the trailer, and under the cut will be our lovely non politically correct reactions! JJ: Yep let’s talk burning! Them There Eyes: First off, everybody state where they watched the final trailer! JJ: In my office cube, with headphones though. TTE: Grocery store parking lot! The Girl With The Pearl: Hiding in the work bathroom. ALL TIME LOW. TTE: The Girl With The Pearl wins! TTE: Exactly, plus I warned not to have food stuffs around me, in case I flailed, screamed, or choked on anything. TGWTP: Winning, in the worst way possible. 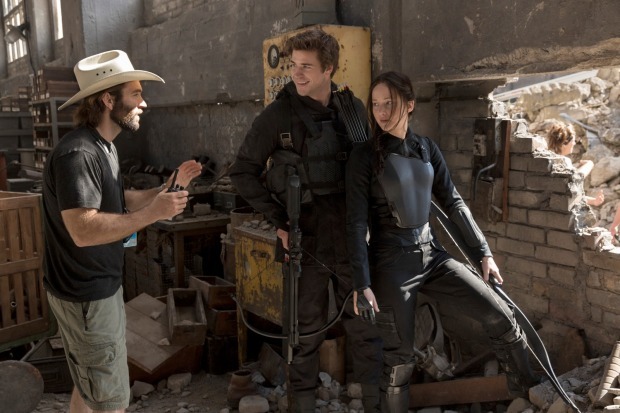 TTE: Hey, at least your not Peeta! Which brings us to the fact that today was yet another day of extreme Peeta-Feels. TGWTP: Poor Peeta! That line delivery was beautiful though! JJ: Every shot of Peeta we see gets worse for him. Thanks, Francis. But Josh totally owned it. So well done! 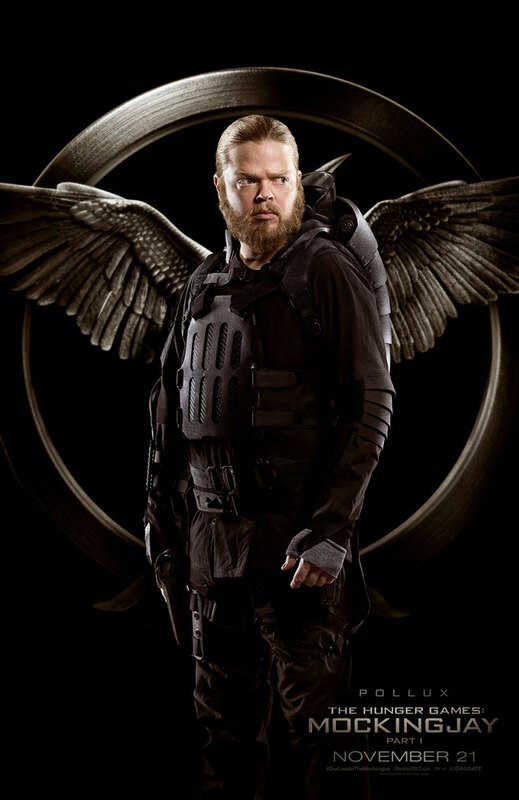 TTE: I know, but we’re total gluttons for tortured Peeta. And yep, Josh is winning all the emotive awards today. JJ: He’s mastered the teary eyes. I imagine we’ll see more of that. And it will destroy us even more. TGWTP: But the feeling bad is a good thing! No one can say they don’t understand Katniss’ Peeta-Feels. JJ: We all feel Katniss’s pain! TTE: I’m looking forward to feeling destroyed by Josh Hutcherson’s acting abilities. JJ: Yes, let him shine, especially since his screen time will be limited. TGWTP: I feel like Josh deserves much more acting credit than he gets. TTE: He’s been making us cry since Bridge to Tarabithia. TGWTP: This movie could open a major doorway as he’s an adult actor now. TTE: You mean it could turn him into the next Ryan Gosling? Or maybe Jake Gyllanhaal? TGWTP: I could get behind that! JJ: I approve of all these. TTE: If he’s going to base his career on anything, I’d hope it would be those two. 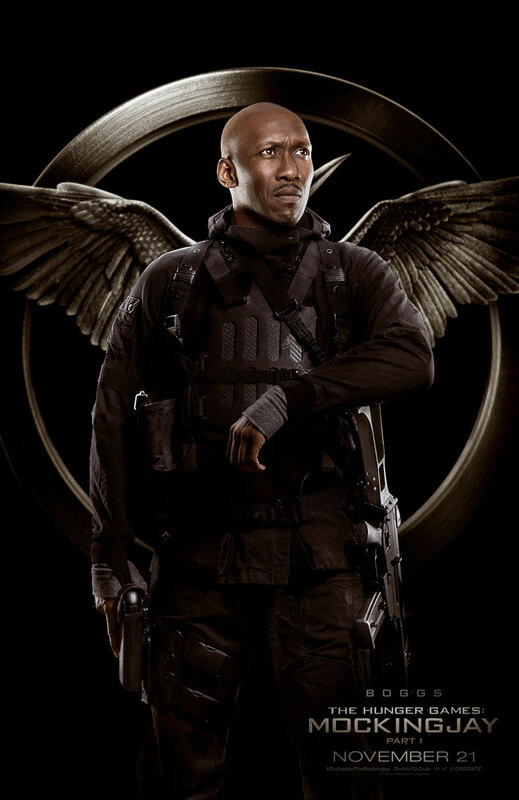 We’ve had some time to stare at every inch of the Mockingjay Part 1 character posters by now. When they first came out (or rather leaked, THIS HAS GOT TO STOP HAPPENING) I wasn’t filled with a whole lot of passion for them, but I told myself that this is somewhat appropriate. 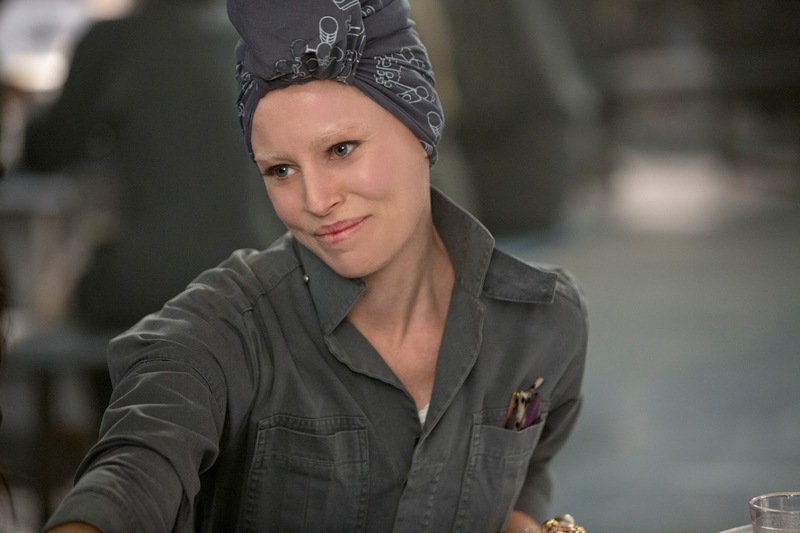 Effie’s poster was the only one that gave me some sort of visual surprise because she looks so different from her old self. These posters are meant to set a mood, and for these six, the mood is pretty somber, no-frills, and grey. I saw some comments that it looked like they were in prison, and well, I won’t argue with that. It’s an accurate interpretation of the book, and I want that. I also know that a lot of thought and care must have gone into the creation of these posters. So I’ll try to dig out a few more hints (For Plutarch and Effie, see TTE’s previous post). Body positioning immediately stands out, especially when you see all the posters together. 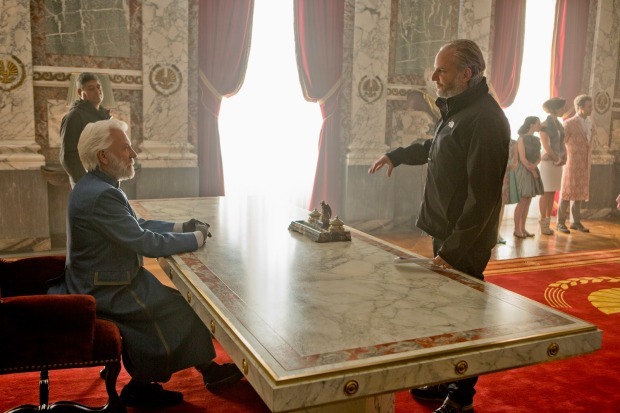 Coin and Beetee facing the left, with Plutarch at a kind of lefty-angle. Effie staring head on like she’s getting a mug shot taken. 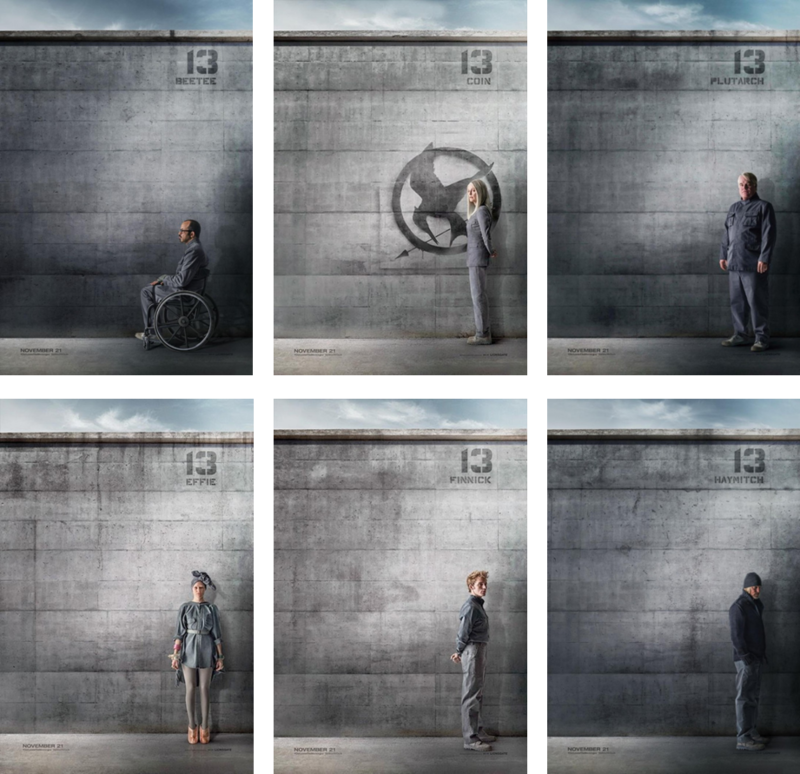 Haymitch and Finnick to the right almost trying to escape off the print. 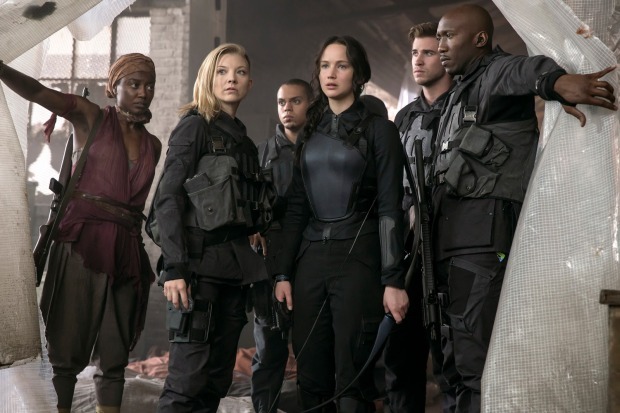 The positioning made me kind of want them to have a “beginning of story” Katniss that is huddled on the floor in the shadows, turned to the right like Haymitch and Finnick. 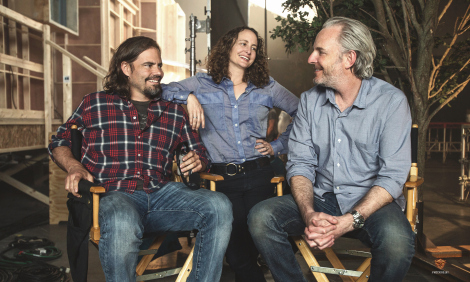 THAT would have been a really dramatic statement, but I suppose they are waiting to debut Katniss in another set of character posters with the field crew (Katniss, Gale, Boggs, Cressida, etc). That miss kind of hurts me though. I would have loved that (Any artistically-minded people, I implore you to create some fanart in that vein). 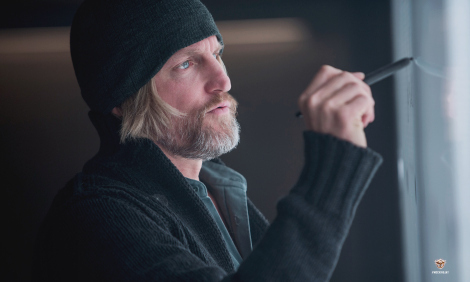 We know there’s no alcohol in District 13, so Haymitch goes through severe alcohol withdrawl, and the pain of that (and everything else) is very clearly etched on his face as he stares down towards the floor. District 13 must have taken pity on the man and allowed him a hat and cardigan to ward off the chill, and in a way hide himself away through clothing. I love this one. Probably because I love Haymitch. It got my coveted phone lock screen spot. Suuure she does. 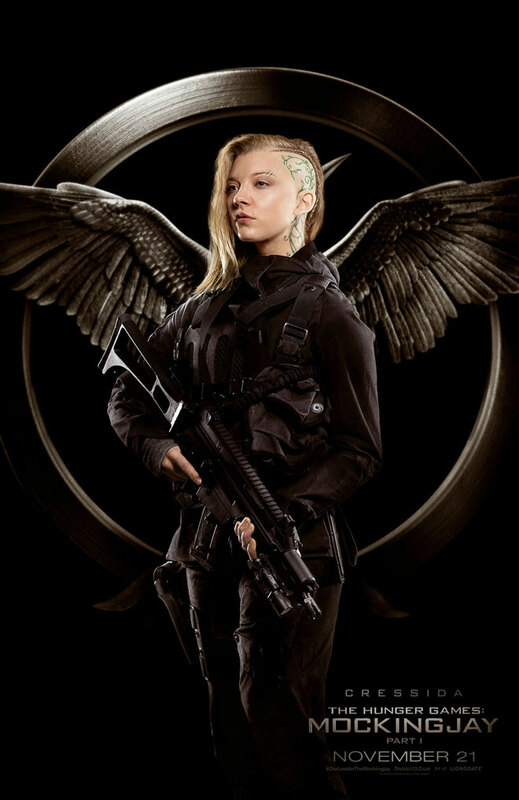 But it does make a statement that she is the only one with the big Mockingjay symbol in the background. We all know that her support is only when it serves her own purpose. She’s a smart woman who understands the power of the symbol and wants to take it as her own. You better believe she’s going to be photographed with that in the background. 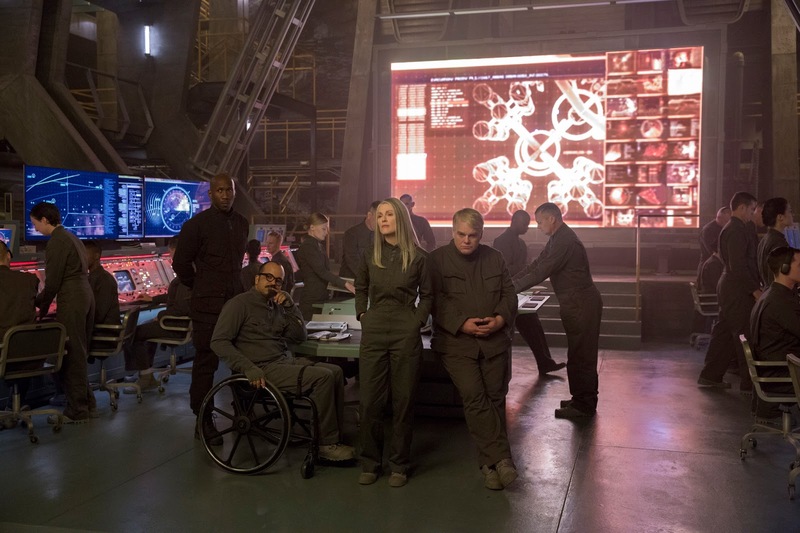 The most striking thing to me about Beetee is not that he’s in the wheelchair. We expected that. But the fact that his body position is dead straight to the left, and he’s looking straight ahead to the left. He is in no way acknowledging us, but probably lost in his thoughts, focused on his task at hand. We know that Finnick will not be mentally well in this movie (or at least until reunited with Annie). Sam’s sad and dazed expression says it all. 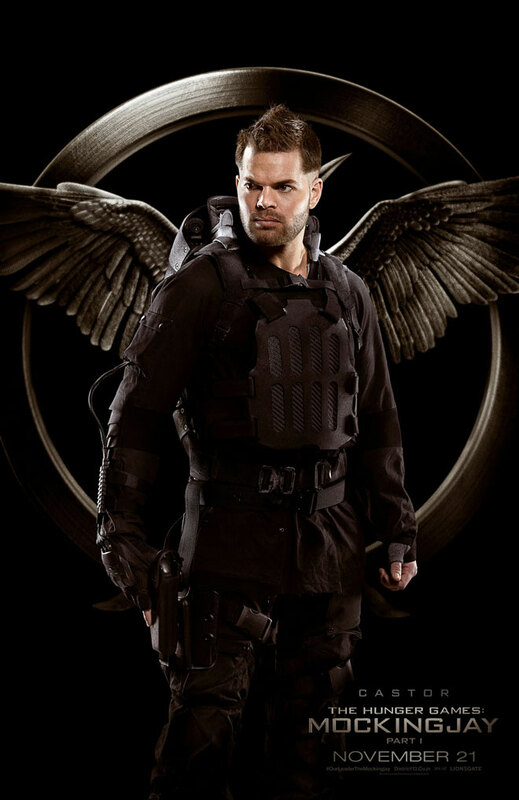 He is, dressed however, in the District 13 uniform, so no joking about him in his underwear right now. Just sad Finnick, trying to hold on another day. 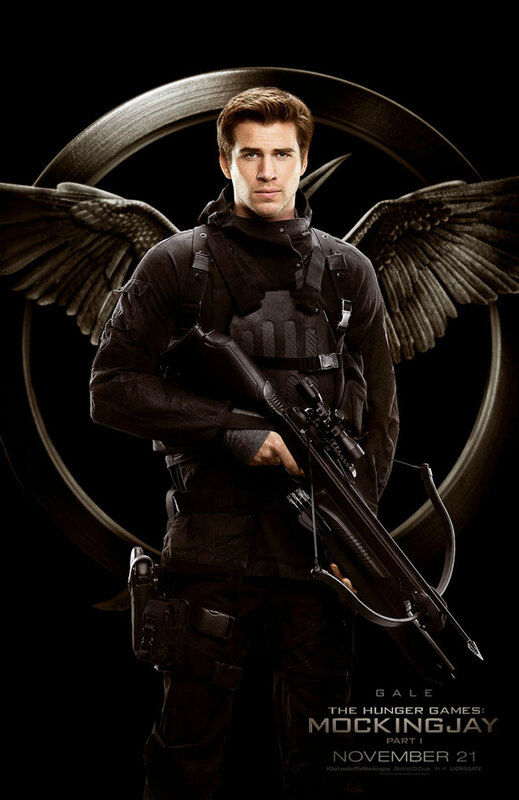 Yes, I was one of the people disappointed about the lack of a Katniss poster. If you’ve read any of my posts for the past few months, I WANT TO SEE KATNISS is kind of my mantra, so no surprise there. And I guess they are waiting to debut her in a more of a field / action type-setting. 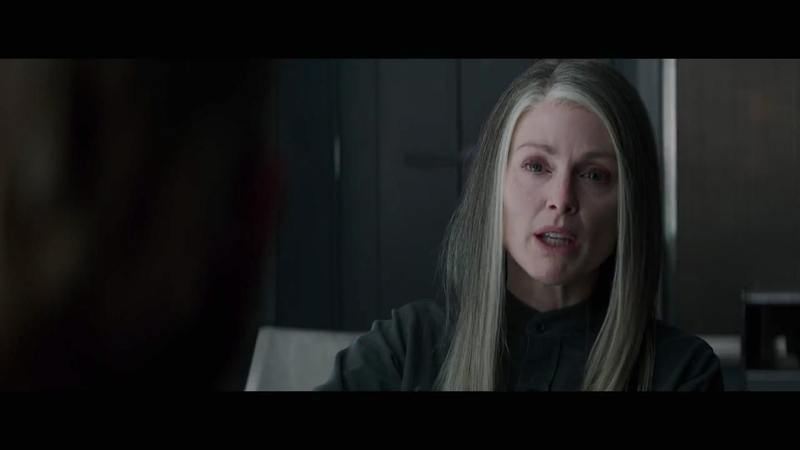 Katniss standing in her Mockingjay suit with these grey walls behind her would have looked out of place, I agree (but wouldn’t you have liked to see damaged Katniss in the corner? I can’t stop thinking about it). I just hope this next set has a little more spark to balance things out. District 13 can be a really depressing place. 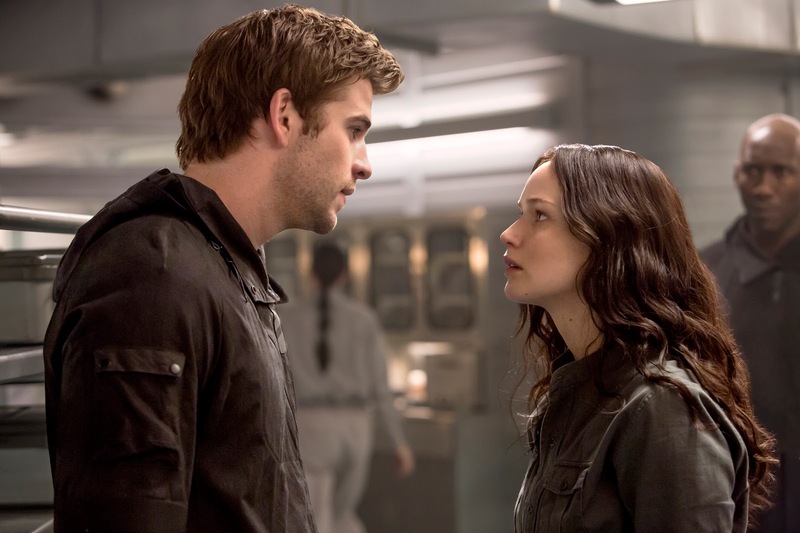 The first traditional trailer for THE HUNGER GAMES: MOCKINGJAY PART 1 is finally here! Congratulations Glenn, the winner of our Third Anniversary Guess The Trailer contest! He won a Catching Fire fan camp poster signed by Josh Hutcherson, Sam Claflin, Jena Malone, and Jeffrey Wright! OMG IT’S TRAILER REACTION TIME! So watch the trailer again and prepare for pure, exuberant fangirl reaction! The Girl With The Pearl: Let’s start with the usual– describe the trailer in one word! JJ: You took mine… I’ll say appropriate? TGWTP: I’ll go with haunting. Which is not my usual direction with these, because trailers usually make me giddy. JJ: Ok haunting is better But for me, it did its job. It set the stage for what the movie’s about. 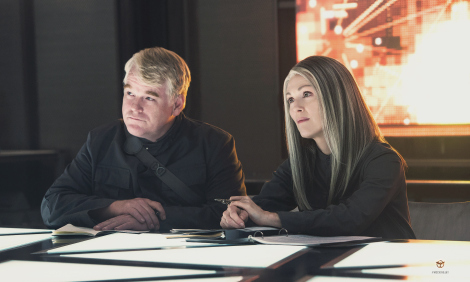 TTE: There’s nothing happy about Mockingjay… ok, wait… yes there are happy points, but it’s not full of as many light moments as the previous stories. TTE: Even the trailer music is somber. 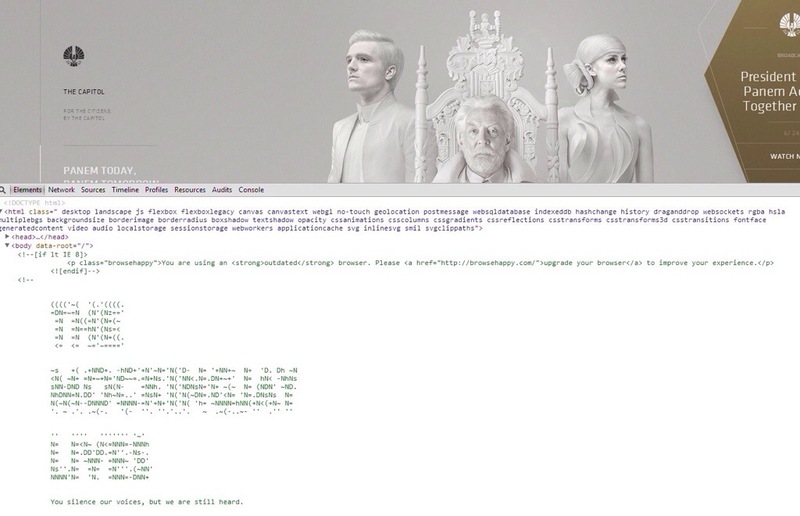 TGWTP: Where you surprised that they opened it with Plutarch and Coin? JJ: Before I was spoiled? JJ: Yes, I was surprised with it. But I think it was a good choice. 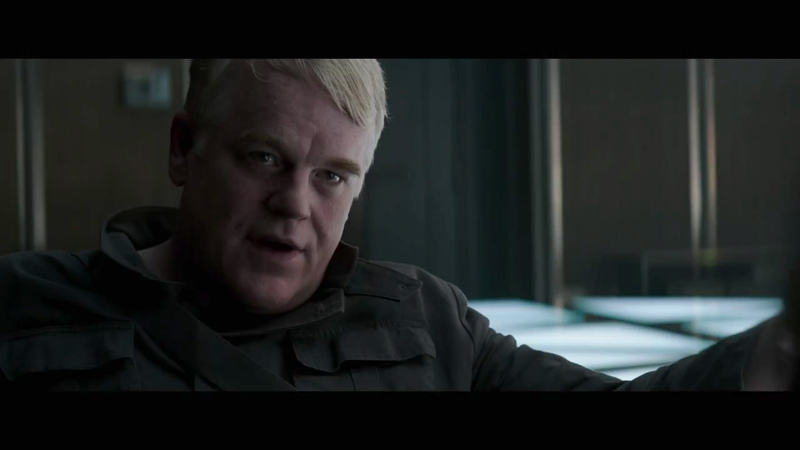 So much of the movie is Plutarch and Coin’s planning. TTE: Pleasantly surprised. Oh, wait.. I was the only one who was surprised?! This is what happens when you work all day, and don’t spend a lot of that time searching Twitter! JJ: Twitter is life, ok? TTE: Twitter is… yeah, I’ll leave my Twitter opinions at the virtual door. TGWTP: True. Anyone who sees her as ambivalent or possibly decent will be raging about the end. JJ: TAKE THIS MOVIE SERIOUSLY! TTE: Stop calling it the next WHATEVER! If you want to call it the next Star Wars… sure, fine– but stop with the teen drama comparisons. TGWTP: You’re not too cool for fantasy, jackass! TGWTP: I love yelling at this fictional critic person! TTE: Fictional critic person looks like a troll and we love to poke him. Is this just here to piss off Peacekeepers? We doubt many district rebels are airborne! TGWTP: Anywayyyyy… Next, we get district drama! 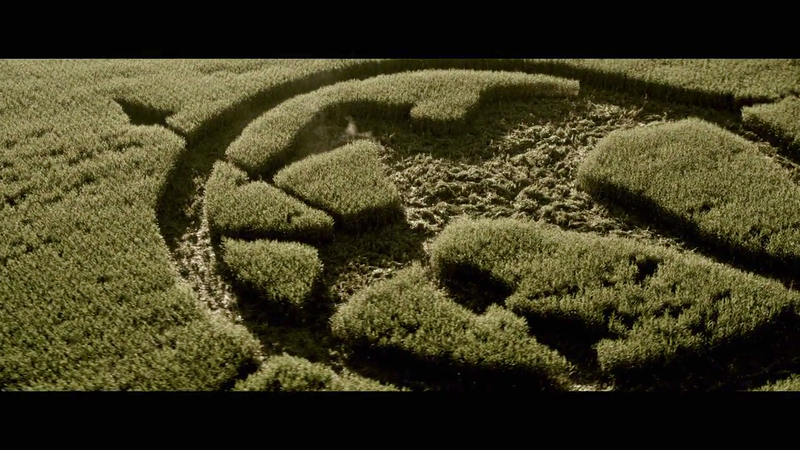 Starting with— How long do you think it would take a person to pull off that crop circle? JJ: It was not people. It was aliens. Plot twist! 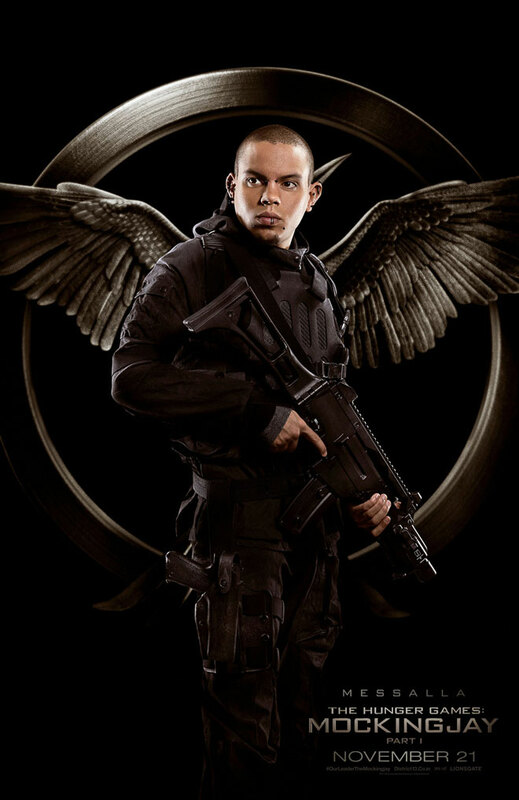 TGWTP: OMG DISTRICT 13 IS FULL OF ALIENS MASQUERADING AS PEOPLE! JJ: Explains a lot, right? TGWTP: And how did they get it so accurate?! TTE: How you make a crop circle accurately: You take geometry in high school, ace it, and then use those skills. I learned this from The X-Files. TGWTP: That was probably the only part of the trailer that allowed me to be happy. Death, depression, distrust, CROP CIRCLE! JJ: Yes, that was a bit weird now that you mention it, but a cool effect.